Do you want to watch Netflix on Kodi? 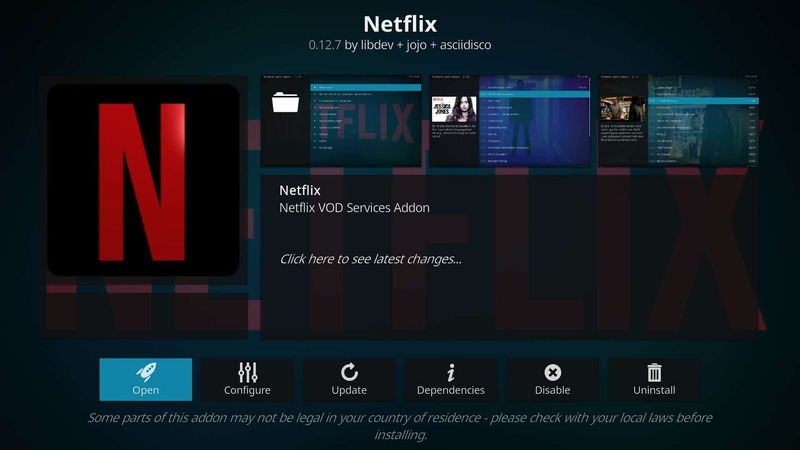 In this article, we’ll walk you through the process of installing the Netflix addon on one of Kodi 18’s alpha builds. Kodi is a popular media center software package. It’s capable of running on most popular devices including desktop PCs, iPhones, Amazon Fire TV, and even USB sticks, and is capable of legally accessing streams from a large number of websites, including Netflix. One of the best things about Kodi is its depth and ease of use; novices can quickly set up a basic media server or install streaming addons, but there’s enough complexity for experts to create more sophisticated setups. Kodi is completely legal to use but has been blighted with negative press coverage thanks to third-party addons and piracy box sellers that provide unrestricted access to licensed content. Thanks to recent DRM updates, however, Kodi can now access a wider range of legal content that require accounts and login credentials, including Netflix. With that in mind, this guide will focus on installing Asciidisco’s legitimate Netflix addon. A VPN will allow you to use Kodi privately, so your ISP and others can’t invade your privacy and see the sites you visit and the content you stream. But that’s not the only reason to use one. A VPN is particularly useful with Netflix. It will allow you to view your favorite country version of Netflix from any location. This opens up access to the full international Netflix catalog with thousands of shows and movies that are restricted to certain regions. We recommend ExpressVPN. It’s a fast VPN with servers in more than 50 different countries and exceptional unblocking ability (it topped our list as the best VPN for Netflix). Further, ExpressVPN is extremely portable, with dedicated apps for Windows, Mac, Linux, iPhone, and Android. BEST VPN FOR NETFLIX:Get 3 months free on ExpressVPN plans here. The Netflix addon can be installed on older versions of Kodi, but Kodi 18 offers a host of new features to enhance your experience. Android users can search for content using voice commands, for instance, while Windows users can install the 64-bit version to make full use of their computer’s hardware. To get started, go to main downloads page and select the operating system you’d like to use. Depending on the platform you chose, you’ll see different options here. Windows and Android offer both 32-bit and 64-bit versions, while OS X only has one option. Click the version you’d like to install. The installation should begin automatically and save to your designated downloads location. For the most part, Kodi 18’s installer is identical to that of earlier versions. However, there is one very important change to make during this process. 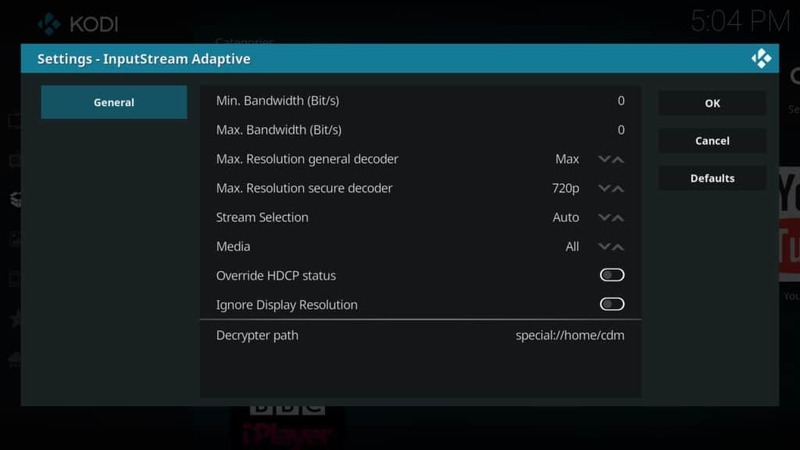 Kodi 18 has the same default installation location as earlier iterations. This means that by default, Kodi 18 will overwrite any earlier versions you have installed. You can keep Kodi 18 separate by installing it in a different location or simply changing the default folder name. Note: as Kodi 18 uses the same profile folder as earlier versions, any settings you’ve changed will also be changed in a fresh install of Kodi 18. Your installed addons will also be present. Asciidisco’s Netflix addon was primarily designed with Android users in mind. It works with other platforms too, but there’s an additional step to take before it will work as intended. Below, we’ll explain how to install it on whichever platform you’re using. Begin by downloading the Netflix addon. Make sure to save it somewhere memorable as you’ll have to locate it in a second. Open Kodi and click the Add-ons tab in the menu on the left. Next, click the box icon in the top-left of the screen and choose Install from zip file. Navigate to the location where you saved the addon. Select it, and you should see a notification in the top-right telling you it installed correctly. If you’re on Android, all that’s left to do is login. Users on other platforms have to create a file in Kodi’s special://home directory, however. The problem is that this isn’t an actual location—it’s shorthand for a folder whose location changes based on the operating system you’re using. Let’s cover how to solve this problem. Netflix uses Widevine Digital Rights Management (DRM) technology to prevent their content from being accessed by unauthorised viewers. In this step, we’ll be linking to a Widevine decryption library in order to allow us to access Netflix’s content. To begin, open a text editor like Notepad or TextEdit. The exact options you’ll see will differ based on the software you’re using but it should be fairly obvious which ones you need to choose. Copy and paste everything from this page into a new document. Next, click Save As. Choose All files in the Save as type dropdown and name the file “libwidevine.sh”, without the quotation marks. Save this to your desktop for now; we’ll move it to the relevant folder in just a second. Now we have to establish the actual location of special:// home on your system. Take a look at the list below and navigate to the relevant folder. Next, create a folder named “cdm”, without the quotation marks. Move the libwidevine.sh file you created earlier into this folder. When you first open the Netflix addon, you’ll be prompted to enter your Netflix login credentials. 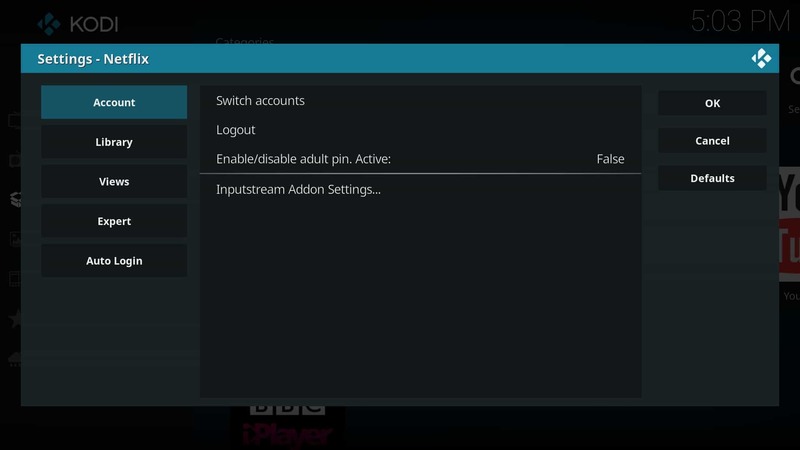 However, you can switch between multiple accounts by going into the addon’s settings menu and choosing Switch accounts. If you have a preferred account, make sure to enable automatic login by highlighting the Auto Login tab and toggling the option that appears. If you find that videos take a longer time to buffer or stutter, you’ll want to adjust the Inputstream Addon Settings under the Account tab. This allows you to change the maximum video resolution and bandwidth, hopefully providing a more consistent experience. We did encounter an issue wherein selecting this menu option caused all other settings text to disappear, but it should appear again the next time you open the menu. You can also set up a PIN number in case you’d like to restrict access to adult content. It’s worth noting that even if you’ve set up parental controls on Netflix directly, this addon will not ask for a PIN unless one is set up in the settings menu. However, there are a few problems with this method. Firstly, the PIN can be reset by uninstalling and reinstalling the addon. Secondly, there seems to be no limit to how many tries a user has at entering the PIN. Third, sometimes the correct PIN number would register as incorrect. For these reasons, we recommend avoiding this feature entirely. Most of the options on the main menu fail to load content. This shortcoming means that the Netflix Kodi addon isn’t ideal for people browsing for something new to watch. However, the search function works as intended. As such, you can search for a specific TV show or movie and watch it completely legally using this addon. All that’s left is to tack on a VPN service if you want to bypass Netflix geographic content blocking so you can watch a larger variety of content than what’s available in your home country. First, sign up for a suitable VPN. We recommend ExpressVPN but NordVPN and CyberGhost are both strong, low-cost alternatives. Download and install the app, taking care to get the appropriate version for your device. Connect to a VPN server in the country whose Netflix catalog you’d like to use. Open Kodi and log into the Netflix addon. You should now be able to stream country-specific Netflix titles. The Netflix Kodi addon still has some bugs to work out but provides a wholly legal way to stream content via Kodi. That said, setting it up is just the beginning. We can also help you set up subtitles and solve any playback issues you might encounter. Netflix is a great streaming platform, but it’s far from the only one. If you’re looking to expand the size of your content library, you might want to check out our guides to the best Kodi addons for anime, movies, live TV shows, and sports.